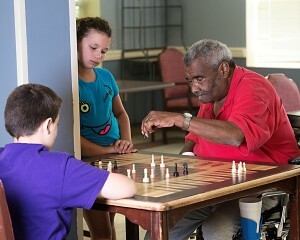 We have a large number of volunteers who share their time with our residents. Kerr Lake Nursing and Rehabilitation Center holds a banquet each year for our many volunteers, where we select a “Volunteer of the Year” and an “Angel of the Year”. This year over 50 volunteers attended the volunteer banquet. 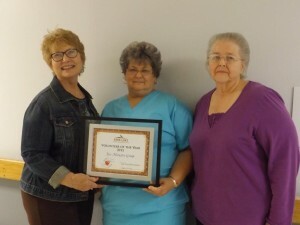 Our 2015 Volunteer of the Year is the Joy Ministry Group from Clearview Baptist Church who visits at least once a month to visit our residents. Our Angel of the Year are the members of the VFW, Tyrone Tart, Mike Ayscue, and Stella Shealy. The VFW visits our veterans of the facility on a regular basis and honors them during special times of the year. In 2013, City Road United Methodist Church was awarded Volunteer of the Year for providing Sunday School to our residents for more than 40 years and the SDA church was awarded Angel of the Year for their services they provide to the facility. In 2014 RA Harris was awarded Volunteer of the Year. RA Harris leads singing and devotions each week. 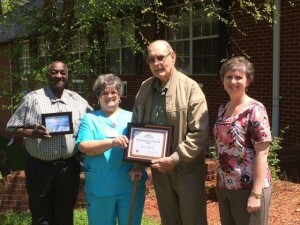 Linwood Taylor was awarded Angel of the Year. Mr. Taylor has been assisting with Bingo for many years. Our volunteers range from church groups, students in school (both high school and community college), a student in the Master Gardener Class, current and former family members of residents and developmentally disabled adults who participate in a local day program. Miss North Carolina Outstanding Majestic Miss 2012 has adopted a grandmother in our facility and visits with her weekly. She also participates and assists in some of our activities.